Learn about Albuquerque, New Mexico by reading "Albuquerque - Spanish and Indian Touch on Modern Enjoyment" by Charlie Spence, Aviation Writer. It features a mini, but thorough tour of the destination, plus all you'll need to know to plan your trip including getting there, objective information on places to stay and eat, and things to do. At the end of the article, we've provided a summary of the contact information for your easy reference. Enjoy! San Felipe de Neri church still stands on the original site in Old Town. When you arrive in Albuquerque you might want to head directly for Old Town. Here you will immediately be a part of the color, atmosphere, and excitement of this fascinating city. On April 23, 1706, the Spanish governor of New Mexico, Francisco Cuervo y Valdes, certified the founding of the Villa de Albuquerque. In those early days, the El Camino Real de Tierra Adentro, which connected Mexico City with New Mexico's capitals, ran right through the Old Town plaza. Today, Old Town looks much as it did 70 years before the American Revolution. As Spanish law of the Indies required at the time, a plaza was established at the center of the villa. 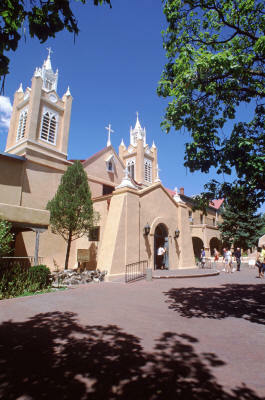 These early Spanish were very religious persons and one of the first structures built is still on the north side of the plaza, the San Felipe de Neri Church, the oldest building in Albuquerque, built in 1793. It is in the ten blocks near that plaza where you will find historic adobe buildings, fine restaurants, art galleries, and shops featuring a wide selection of Southwestern goods. Select some of the fine pottery, jewelry, or weaving's from a store or choose a painting from one of the native artists along the portal east of the plaza. Albuquerque has sunshine about 310 days a year so it is an excellent place to get in your outdoor activities. Of course there are fine golf courses (14). Maybe you prefer to leave the driving and putting to your familiar home courses and don hiking boots for some scenic beauty that cannot be found elsewhere. For this, take a ride on the Sandia Peak Aerial Tramway. The Sandia Mountains form the eastern boundary of Albuquerque and the Tramway slowly takes you up the 10,350-foot peak where you get a panoramic view of the area. In these Sandia Mountains go hiking among dormant volcanoes, or ride a bike over these rugged but beautiful trails. Albuquerque is an ideal place to fall back into the old west, partner, and swing yourself into the saddle of a trusty steed for some ridin' through the brush. To really get into the spirit, stay at a working guest ranch and live the life of a cowboy for a few days - riding, roping, and cookouts. At some of the guest ranches you can pamper yourself with a spa, play golf, take carriage rides, enjoy tennis, or just loll around a pool, New Mexico is one of the nation's most sparsely populated states giving you plenty of opportunities to explore some of the wide open spaces. Albuquerque is considered the balloon capital of the world because of the excellent flying weather and because so many of the permanent residents are balloonists. The Balloon Fiesta is held here annually and it attracts scores of balloonists. Lasting more than a week, this fall event not only provides exciting aerial rides but also fills the sky with a colorful array of balloons that you can see nowhere else. Just south of the launch field be sure to visit the International Balloon Museum. Exhibits at this museum go through the history of ballooning and show how hot air and gas balloons have been used over the centuries since they became the first means of human flight. Many exhibits combine historic facts with multi-media technology giving you the feel for the adventure, scientific experiments, the arts, warfare, espionage, and the exploration of space roles of ballooning. And while you are in the mood for museums, visit the Museum of Natural History and Science, which is within walking distance of Old Town. Here you can walk through a simulated active volcano and experience the Ice Age. Follow along through the history of the New Mexico area from the days of the dinosaur and see recent discoveries like the fossilized dinosaur skin and a dinosaur egg. Also near Old Town drop in to the Indian Pueblo Cultural Center, which is dedicated to preserving the Pueblo Indian culture, history and art. The National Atomic Museum is another must see. It was at Los Alamos, north of Albuquerque where scientists developed, produced and tested the first atomic bomb. Exhibits here will take you through development of "Little Bob" and "Fat Man" through to the current technologies. See the documentary film "Ten Seconds That Shook The World" for newsreel clips of the 30s and 40s leading up to World War II and the beginning of the atomic age. From its founding, Albuquerque has played an important role in the development of the area. It is near the old Santa Fe Trail leading to the west. When the railroad came it was a major trading area, stocking goods from the East to be sold to settlers. The Historic Route 66 - now called Central Avenue - wove its way through the city and what was an important highway still connects many of the city's attractions. Follow it from the western side of the city and you will pass through the Rio Grande Botanical Garden, Old Town, and the New Mexico Museum of Natural History and Science. One doesn't normally think of New Mexico as a wine country but some 150 years before wines were made in California, missionaries planted grapes in the Rio Grande valley, making this the oldest wine-making area in the United States. The high desert's warm, sunny days and crisp cool nights let the local wineries still today produce some award-winning wines, which are offered in many of the restaurants all over town. Some of the wineries offer tours. If sipping various wines starts you thinking of nightlife you will find it is in several places in the city where some are grouped almost in clusters. It is easy walking distance from one to the other to take a sample of all. Visit downtown or Nob Hill for the largest clusters of pubs, live music, dancing, wine bars, breweries, and restaurants. The cuisine is an interesting mixture of Native American, Spanish, and Mexican, providing some of the tastiest dishes found anywhere. When ordering your food, be prepared to answer the question: "Red or green?" This refers to the red or green chili. The chili is featured in every meal from breakfast through dinner. More chilis are grown in New Mexico than in any other state. Perhaps they can symbolize your trip to Albuquerque where you can have a red-hot vacation and have friends green with envy. Albuquerque has two excellent airports: Albuquerque International and Double Eagle II. When approaching and departing either remember that the altitude is more than 5,000 feet. Hotels, resorts, bed and breakfasts, ranches - take your pick of accommodations to fit your desires. Hotels and motels range from the basics to the plush. Select a bed and breakfast and you might find yourself staying in a renovated Victorian mansion or a Southwestern adobe. There are more than 16,000 rooms available and you will find the rates and taxes are among the lowest in the nation. You may also book your accommodations and rental car at IFA's Online Travel Booking Service Deep discounts may apply. Prices at most restaurants are reasonable.